Chinese global issuance of green bonds declined 12% in 2017 compared to the previous year, according to data tracked and tagged by Bloomberg. Issuers continued to be large, state-owned financial institutions but participation is growing from corporations and municipalities. With monetary policy and lending rules expected to tighten across the Chinese economy in 2018, BNEF expects green bonds will become a more popular tool for raising capital this year. Total green bond issuances from Chinese entities as tracked by Bloomberg data bases reached $30 billion (both onshore and offshore) in 2017. China’s share of global green bond issuance fell to 23% in 2017, from 38% in 2016. Despite the slowdown, China remains the single largest country-source of green bonds in the world. However, if counting non-bond debt-instruments, specifically green asset-backed securities (Green ABS), the United States ranks as the top source of green financing in 2017. BNEF tags green bond issuances globally based on a specific criteria (see Guide to green bonds on the web | Terminal). Our $30 billion total does not include bonds labeled as green in China but for which proceeds were not 100% used for green projects, such as clean coal. Our total also does not include Green ABS and private placements for which information was not disclosed. These factors, along with other data inconsistencies, help to explain the difference between our total and the official Chinese total of $38.6 billion. State-owned enterprises (SOEs) continued to dominate the Chinese market and accounted for 94% of total green bond onshore issuances. The share of corporate issuances has risen from 15% in 2016 to 25% in 2017.Top issuing entities are the Bank of Beijing and the China Development Bank; and key bond investors include the China Merchants Fund Management, China Merchants Securities, Penghua Fund Management Co Ltd, etc. 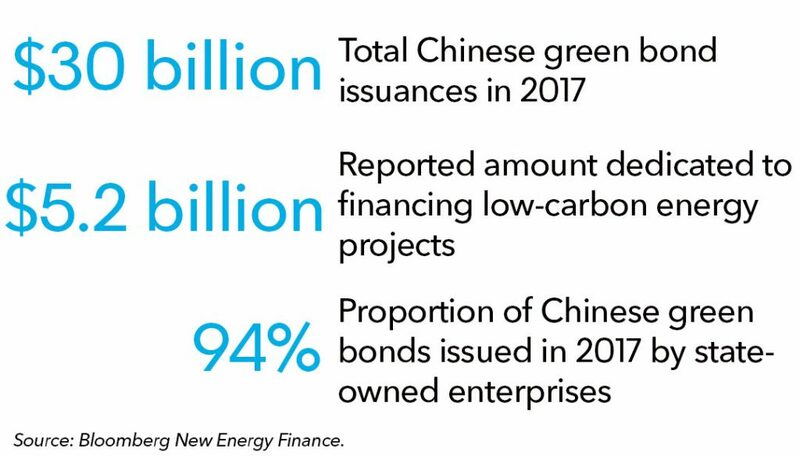 Approximately 45% of green bonds issued by non-financial Chinese entities in 2017 were earmarked for low-carbon energy projects (including wind, gas, biomass, and hydro), equivalent to the proportion in 2016. Notably, solar is not a key target sector for green bond financing in China in the last two years.